^ Lawrence, Ken. 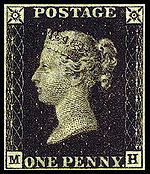 Before the Penny Black. Ken Lawrence. 2000 [28 June 2008]. ^ H. W. Hill, The Fight for the Penny Post, London and New York, Frederick Warne (1940), pp. 75–79. See Plate 1. ^ Great Britain: Wednesday, May 6, 1840. First Issues Collectors Club. 3 November 2003 [28 June 2008]. Golden, Catherine J. Posting It: The Victorian Revolution in Letter Writing. University Press of Florida. 2009. ISBN 978-0-8130-3379-2.